I'm unique. No, not because of any personal quality, although I do like to think of myself as something of an eccentric. No, I'm unique because I'm the only human being on the planet that didn't absolutely adore Sin City. Now, don't get me wrong, I didn't hate it. But I've spent more time defending my review of the movie this last week than I ever imagined I would. Once in awhile you have to be out of step with the rest of the herd, if for no other reason than to give the wolves something to focus on. When it comes to the toys, I'm in line a little better with my brethren. I've already reviewed three of the regular 7" scale figures, and this week I splurged and picked up the 18" version of Marv. Marv is of course one of the main characters of the film, and for me, was a close second to Kevin as the most interesting. 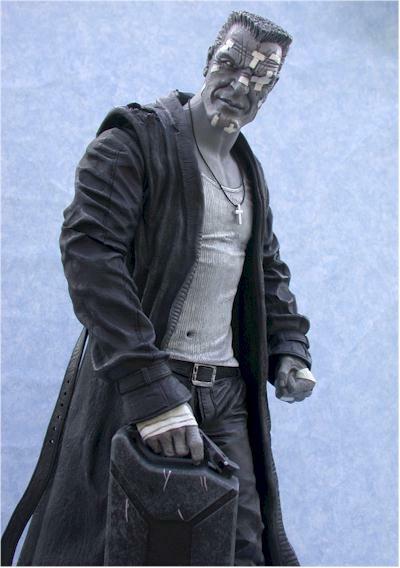 The 18" Marv also has a talking feature, not surprising since he's from NECA and they generally include such a feature with their 18" figures. This big guy retails for $35 - $40, depending on where you pick him up, and I have some online suggestions at the end of the review. There is a Spencer's exclusive color version of this figure as well, but otherwise he looks the same. If you've bought any of NECA's other 18" figures, then the box will be no surprise. It's big, but the window tends to take on damage, especially the top edge. The graphics are great though, and on the back you can see both the black and white and color versions of the regular figures. There's also the addition of specific text for Marv, and some great photos. It's not collector friendly though, and there's a ton of twisty ties. If you've seen the small version, you've seen the large version. One of the possible problems though with a significantly larger version of the same sculpt is loss of detail. What looks tremendously detailed in a 7" sculpt can become rather soft and plain in an 18" format. Fortunately, that's not the case with Marv. 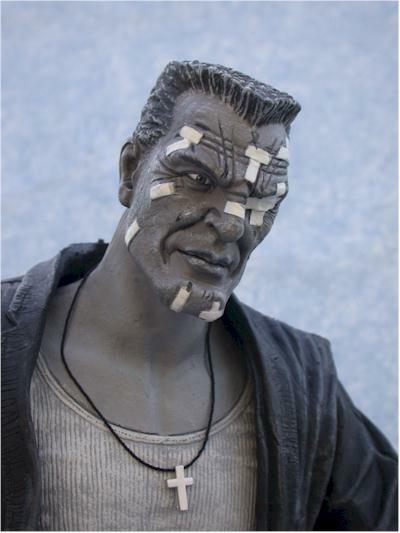 The head sculpt looks fantastic, and this is the bandaged version. I'm not implying there is another version planned - there isn't that I know of - but since there was also the un-bandaged version of the small figure, it's worth noting. 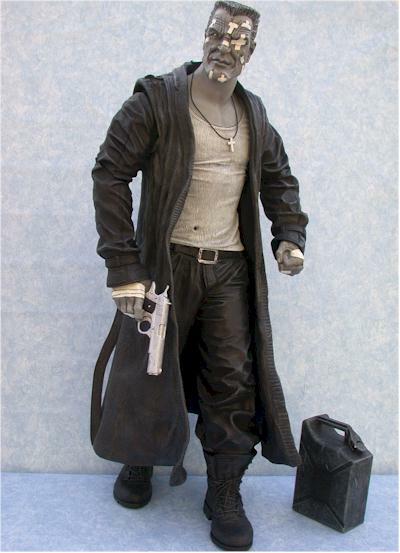 The soft rubber material used for the coat and belt works great, and the sculpt has a nice flow to it. The walking stance works fine, especially after seeing the film. It's probably the closest thing to a trademark pose for the movie version. The right hand is sculpted to hold the gun or gas can, and the left is sculpted into a fist. That's fitting of course, but he can only hold one of the two accessories, and there's really no place for him to stuff the gun if it's not in his hand. The material on the hands is also a softer rubber, which makes it easier to get the accessories in and out. Even though they are softer than usual, they still grip things fine. Lots of folks find the use of washes by NECA annoying, and I do have to admit that they can overdo it at times. Most of the issues here though aren't related to wash, at least not for me, but it's an issue worth mentioning. Judge for yourself from the photos if areas like the shirt or face are too overdone for your tastes. The paint ops are fairly clean, but there's a little slop here and there. 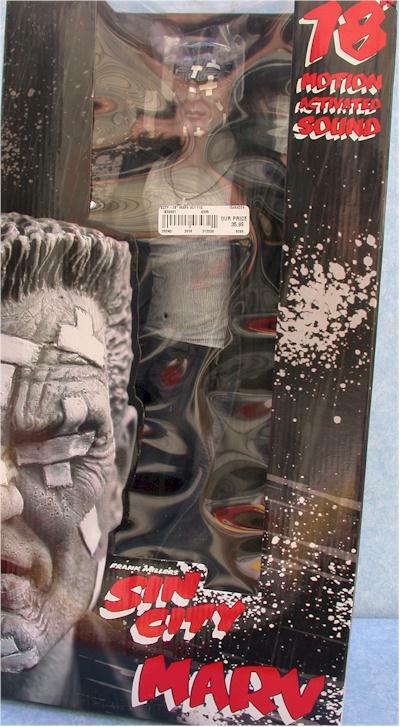 Similar to the smaller figure, the face gray is darker than the chest and arms, although it's not as pronounced here as it was in the 7" scale. There are also a few things that were done in the smaller scale to create false shadowing, that simply don't work in a much larger scale. For example, a thin dark line was added at the top of his t-shirt against his gray skin. It worked great in the small scale to give the impression of depth, but in this huge figure it just looks like somebody painted a line around his shirt, and somewhat sloppily at that. There is also a bit of an issue around the white shirt showing through the shoulder area. This was a small issue with the 7" version, because whenever you move the arm, there's a gap created, and you can see the white shirt. In the larger scale, the gap is more noticeable and more distracting with the white shirt underneath. Since the jacket is not intended to be removed, some spot painting of black around the interior shoulders would have been a good idea. The smaller 7" scale figures aren't super articulated, but here's a case where the 18" version is even less. Marv has the most important joint - let's say it all together now! - the ball jointed neck. The neck has a good range of movement, and you'll find it extremely useful in giving him just the right attitude on your shelf. He also has ball jointed shoulders, cut elbows, cut wrists, and a cut waist. The shoulders and elbows are awfully loose on my figure though, making it very tough for him to hold the arms up or out in too many poses. They tend to droop back down on their own, and the shoulders are particularly weak. It's not a matter of possibly breaking them - they feel plenty sturdy - but one of looseness. The smaller figure also had cut joints on the legs, and you might think this version does as well when you look at him in the box. He certainly has the lines in his pants like there are cut joints. But that's all they are, sculpted lines, and his legs are solid from the waist down. Fortunately, he stood fairly well on his own, since getting the adjustment just right is out of the question. It's not perfect though, and I did find he topples pretty easily with a slight bump or breeze. 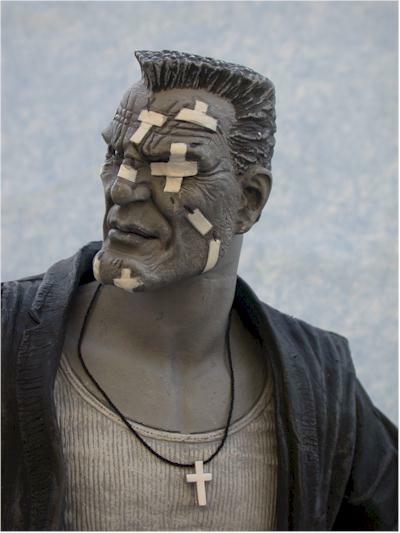 Quarter scale figures are not known for extensive accessories, but Marv has two which work well with the character. One is his gun, Gladys. Only real men name their guns. It's scaled a tad large, but I prefer oversized to under. Shut up. The second is a gas can. Although it's hollow, it doesn't open. The paint ops on both are good, and he can hold either in his right hand easily. Moving parts on either would have been nice, considering the scale, but aren't necessary. Still, that's how they could have boosted themselves a higher score in this category. You could also count his necklace in this version, because it is a separate piece and can be removed. Be careful with the string though - it would be pretty easy to break, or lose all together. I'm actually kind of surprised that it isn't held in place inside the package somehow, considering how tightly everything else is locked down. 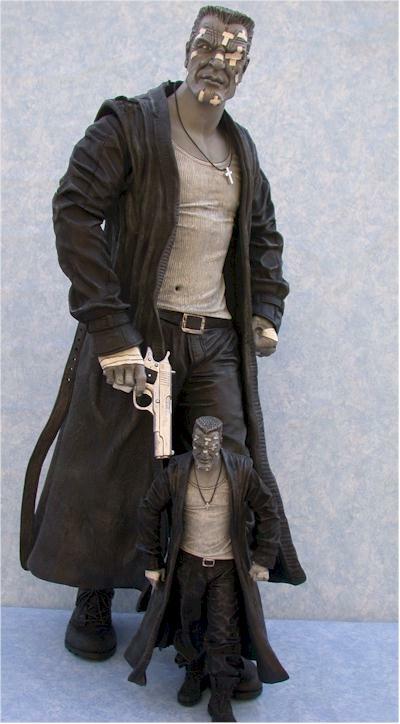 Sin City isn't a movie most kids will see - I hope - and 18" figures aren't really designed for 'play'. 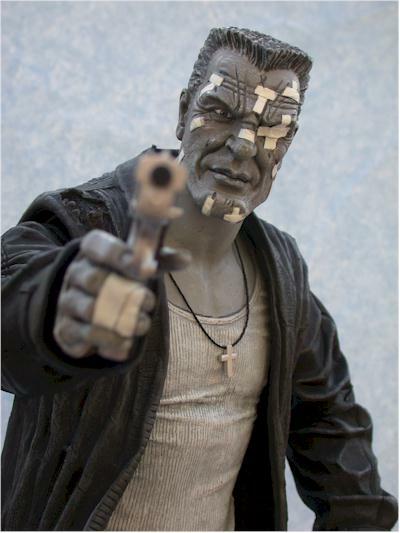 Of course, Marv could actually use this figure to kill four or five guys, and he'd have a lot of fun doing it. "That there's one damn fine coat you're wearing"
"This is blood for blood by the gallons. This is the old days, and the bad days, all or nothin' days. They're back!". The on/off switch is hidden up under neath the back of the jacket, and the speaker is centered on his back as well. Both are out of the way, but since the talking feature is motion activated, there also had to be a motion sensor somewhere in front. On Marv, this is on his stomach, low to his right. The white shirt means it's very obvious though, but I suppose you can pretend it's a bullet hole. For me, it's distracting, and I wish it could have been on his thigh, or perhaps his belt buckle, where the black would have hidden it better. The lines are very clear, but I think a better third choice would have been "Is this all you got, you pansies? ", and that might have left them enough room for a fourth line. However, I bet that at the time of production for these figures it was tough to make the call on what would be best. Quarter scale figures are never cheap, but the ones from NECA, made from very solid plastic, are at least in a reasonable range. I'm assuming you end up paying close to $40, although it is possible to find him for as little as $35. I didn't have any issues with mine in terms of possible breakage or things that might give you trouble that could be avoided. He's definitely sturdy, even with the floppy joints and softer rubber hands. 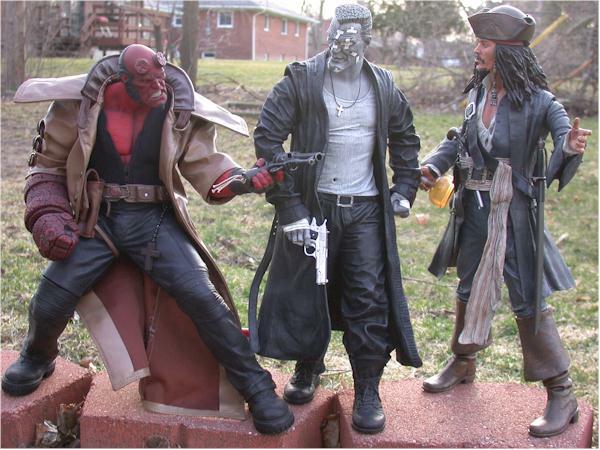 NECA is really king of the quarter scale market right now, and figures like Sparrow and Marv illustrate that. Oh, they aren't quite as cool as the mixed media art style quarterscale stuff from Sideshow, but they aren't $300, either. This figure would have picked up another half star were it not for the issues around the white shirt showing at the shoulders, some of the slightly hinky paint ops, and perhaps some better lines from the film. Still, he looks great next to my other quarter scale figures, and I'm glad I grabbed him when I did. I didn't pick up the 18" Bride figure, and now I really regret passing her by. I didn't plan on making the same mistake with Marv. NECA has 18" versions of Willy Wonka, Robocop and Terminator planned, just to name a few. I suspect that with companies like Mezco doing 18" Family Guy figures, this particular scale is going to be big for the next 12 - 18 months. I'm running out of room three times as fast! - Killer Toys has him in stock for $38. - CornerStoreComics has him for $35, in stock! - OMGCNFO.com has him for $38, and you can ask for a minty box.